As a small business owner you are often faced with the problem of coming up with new content for your blog and social media. But have you considered recycling and re-purposing? Just like the paper you use in your office or that can of cola can be recycled, so can some of your older blogs or social media posts. A great amount of your best work can often be re-written or re-purposed to fill your current needs. Quite often content you previously created can be updated and re-used to serve a new purpose or be re-focused to a different audience. Remember that delivering your message in various ways (especially over time), can not only increase the retention and impact of your message, but it allows you to describe what you are saying from several angles or perspectives. Re-purposing content is the changing of a previous writing’s format and/or content to deliver it to another target audience. Changing writing for another intended audience could be as simple as changing the words used to appeal to a different audience or category. 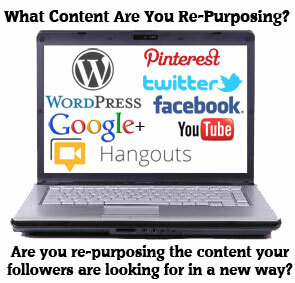 Re-purposing content can also be taking a previously used concept or article and using it to support (or be a part of) a new concept or article. But it can also be used to bring new life to an old idea or concept. Sometimes, even the way you begin your article can be targeted to a specific audience. For example, if you’re writing about skiing, you could target your content to skiing enthusiasts, equipment manufacturers, ski resort operators, fitness buffs and so on by using different lead-in content. When re-purposing content, be clear to your audience that you are referring to or using ideas from a previous article or writing. Keep in mind that the idea of re-purposing content is not to be confused with revamping previous content for the sake of generating new content. Revamping content is using an idea or section of content again for the same purpose. Re-purposing content, on the other hand, is changing the entire purpose of an idea or writing of content for a totally different purpose. Sometimes, you have to think of different ways to re-purpose your content other than just re-writing it to suit a different audience. Try taking some of your previous ideas or writing and re-purposing them in an infographic or other medium, to tell the same story but only in a visual way. One of our office space tenants is currently taking some of their content and making it into a video. This will attract a new audience who likes to learn in that particular format.